senior picnic, originally uploaded by shaunaforce. Summer vacation. We can taste it. Every student and teacher at school is leaning toward it, exhausted and ready for three months of sleeping in, wandering in indolence, and discovery. For months, everyone has worked diligently, churning out research papers and grading World War Two exams and producing journalism publications. But at this point in the spring, with the air lambent until late in the evening, we are all starting to lean away from each other and the work at hand. Students spend more time outside on the tiny strip of green grass in front of school, lounging and longing for a few dapples of sunlight on the skin, than they do in class. Frankly  and I say this with utter love  we are all tired of each other. Time to go. This weekend, I sat on a wider strip of green grass, on an early Saturday afternoon, having a picnic with the most talented, spirited group of students of my entire teaching career. I dont play favorites  I love all my students for the quirky individuals they are and the experiences they add to my life  but I cannot hide this one. My senior creative writing class this year was an extraordinary group of human beings. I was, throughout the year, consistently in awe of them, always eager to teach them, and delighted to hear their stories. And, throughout the year, I have maintained my silence about anything to do with my teaching job on this website, because of a mutual agreement with the administration of my school. After all, this is a food website (ostensibly). Students dont have anything to do with gluten-free living, do they? Well, actually, they do. These senior students do, in particular. You see, I have had the extraordinary privilege of teaching these funny, alive beings for the past four years. During their first year of high school, I taught ninth-grade Humanities, where we studied the Greeks and Romans, interpreted the worlds religions, and pondered the meaning of life. When they were sophomores, three students of this group took my journalism class, where they figured out how to write arresting leads and complete assignments (somewhat) on time. Last year, when they tackled their junior year, I taught on a team that offered lessons on 20th-century American history (grim) and literature (exhilarating), marching our way from World War One through the 1980s. And this year, eighteen of these amazing beings wrote every day in my creative writing class. Four years of instructions, banter in the hallways, conferences on the couch in my office, and enormous changes. And by enormous changes, I mean not only the natural maturation and growing pains of four years of adolescence, but also the years of ill health I endured from their first days of high school. When they first entered the hallways of our school, tentative and desperate to fit in, I did not realize I had celiac disease. I was exuberant but exhausted, all the time. And now, I realize from my research that any trauma to the body can kick celiac into higher gear, activating it to emergency state. When these students were freshmen, I had emergency abdominal surgery in January for a fibroid tumor that had ballooned to the size of a grapefruit in a matter of weeks. I missed six weeks of school after that, and I never recovered my energy. The next year, I endured a terrible car accident in December. Grateful to be alive, I nevertheless suffered with crippling back pains, migraine headaches, and sometimes-unendurable exhaustion for the next year. Plus, another six weeks of school gone. Last year, when they were struggling to figure out who they were as juniors, I descended into the hellish spring of pain, lethargy, and terror before I was finally diagnosed with celiac disease and began this gluten-free journey. It took until this year for me to realize that the three years of lousy health and lingering pain were related to gluten. The fibroid tumor? Womens hormonal problems are correlated with celiac. The injuries from the car accident that lingered long after I should have recovered? They all disappeared when I stopped eating gluten. The constant viruses and colds that used to knock me out for a week and medical maladies that mystified everyone? All because of my lack of nutrition and general ill health from celiac disease. I was beginning to think I was cursed. I didnt know that giving up bread and eating mindfully could change my life this thoroughly. And this year? Since I have stopped eating gluten, I have never felt so good in my entire life. I have never been so alive. And this year, I have not missed any significant amount of school, for the first time in the four years of these students high school careers. Through it all, I have been reading their analytical essays, listening to their questions in conferences, and helping to interpet their minds in the miasma that is high school. For four years, we have laughed together  they collect stories of people tripping and falling for me. For four years, we have discussed literature and current events and historical figures and poetry and absurdities together  sitting in a classroom, leading a discussion is one of the greatest honors of my life. For four years, we have learned together  any teacher who tells you that she knows more than her students isnt a good teacher. I have been deeply informed and changed by knowing these people and reading their writing. How could I not love them after all these interactions? As someone close to me said recently, these people are more like my nieces and nephews than anonymous students. Its true. I love them that much. So I hope that everyone will understand why I have to break my silence about school  this one time  to share these students with you. You see, on Tuesday, they will be graduating. And I know that, as soon as the music sounds and they begin proceeding in to leave the school, tears will spring to my eyes. I will realize again how blessed I have been to know them. And then I will let them go. Before that happens, we all gathered one last time, but this time, outside of school. 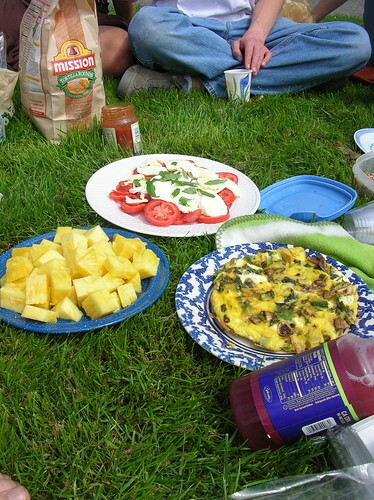 Almost every member of the class and I perched on the grass of a park here in Seattle, sharing stories and eating food. An end-of-the-year picnic, to mark the moment of transition. To celebrate. To eat more of this life together. All year long, we have been in a classroom, discussing the written word. We sat in a circle, each of them at their desks, with me sitting on the sturdy science table at the head of the class, bouncing my feet as I talked. At the beginning of every class, I asked the same question, Stories? Anyone have stories? And so they shared fumbling tales of bad movies, strange men at bus stops, and late nights of looking for meaning or at least the assignment they had just completed. Over time, they all became extraordinary storytellers, and even more avid listeners to each others stories. Even though some might see this rambling, ambling story time as a waste of time, I know differently. As they tell stories and feel heard, as they listen to stories and feel part of a community, they learn each others lives. After stories, they care about each other, and thus they care about each others writing. On the last day of class, I read them an essay I had just discovered, called Miss Ivory Broom, which contained this line I dearly love: Story is the assassin of despair. And so, we told stories. And so, we danced our way through weeks of writing personal essays, played with poems all late autumn and early winter, dabbled with the magic world of writing fiction through the lean grey days of winter into early spring, watched clips of films in the dark and tried to write screenplays through the return of light to the land, and worked on argumentative essays and personal writing projects until the end of the school year. There were dazzling pieces read every day, a sense of awe in the room as everyone else listened, and plenty of applause after the last word reverberated in the air. Mostly, we appreciated. What did I teach them about writing? Not enough, it seems from this point in the year. But mostly, how to pay attention. Slow down and appreciate. Write from the place of I dont know, instead of insisting on enforcing ones opinion through the words. Singing with the ineffable. Listen. Write with sensory details. Let the world soak through into you, and then onto the page. Love humanity and all its foibles. Write every day. Stop doubting. Allow yourself to make mistakes. Revise, revise, revise. Learn to laugh at yourself. Indelible. Visceral. Urgency. Mostly, just keep writing, then write some more. And so, we all tried. Of course, early in the year, I even had them try their hand at food writing. I put squares of dark chocolate on their tongues with their eyes closed and made them write about the actual sensation of the taste. We searched our minds for our favorite memories of food as children. They wrote about meals of macaroni and cheese they had shared with friends, pasta in the Cinqueterra, and the perfect late-night sandwich. We revelled in each others descriptions. We grew hungry together. We ate food and laughed. On perhaps the most extraordinary day of the year, which happened to fall on Halloween, the class finished that grading period by reading personal essays to each other. They each stood up and read deeply personal pieces, funny and devastating, about visiting concentration camps or longing for fathers or obsessions with q-tips or confusions with the future. They were singular, spectacular, and unforgettable. The fact that everyone in the room was dressed as a ninja or pirate or sailor boy probably allowed them to drop their guard even more than before. (It certainly added to the surreality of the situation.) After several of the essays, many students had tears in their eyes. But when the last student stood to read his story, we all let go and wept. A young Korean man, normally too shy to speak in class, read a stunning, honest essay about his mother dying of cancer. It was not maudlin. It did not ask for pity. It was unflinchingly kind and real. When he finished, every teenager in the room, as well as their teacher, was crying, unabashedly. There was a deep, caring quiet that I did not want to break by instruction. So we all stood together, taking it in, appreciating. They gave each other hugs. I said I felt blessed. They left the room for vacation. And we were never the same. There is simply no way for me to convey the beauty of these beings. I wish that I could. If I could, I would feel I had done some small part of my job. But instead, I will just share this. Danny reading a cut-out poem about love that hit everyone in the room in the gut. Jacob breaking into giggles, uncontrollable, from sleep deprivation. So Young hitting Jae Shin on the arm when someone else told a story about how good her boyfriend had been to her. Zach directing his actors in the reading of his one-act play in April. Becca reading a Sharon Olds poem to the class, breaking her usual bravado with misty eyes. Eva gesticulating wildly with her hands, carving circles in the air, as she told another story. Maya struggling with the new form of writing every grading period, resisting, then falling in love with it after four weeks. Lilly reading her latest performance poem, triumphant, the sounds playing in the room, her fellow students dazzled. Alex R. sitting next to Alex I., and every time I called on either one of them to read yet another gorgeous piece of writing, they both turned their heads toward me. Why did they always sit next to each other? Caitlin behind her enormous sunglasses, eyes bleary after staying up all night, working on her end-of-the-grading-period project, yet another stellar piece of writing. LaNika reading the poem she had written about New Orleans and we are all stunned into silence. Bryan smiling shyly when we called on him to read. Jamie telling stories of her trainer, and horse shows, and trailers being stuck in the mud. Kris launching into another long, seemingly pointless story that will captivate us all only one minute in, by saying, Well…. Jared, every time he read a piece, modest and modulated in his voice, leaving every person in the room in awe of the way he played with words. And Mackenzie, who had spent many sad times on the blue couch in my office during her freshman year, sitting confidently upon it  grown up and smiling  on the last day of classes. My god, I am going to miss them. And it turns out that these students know a secret that most of my readers do not know yet. As this tremendous year of my life has progressed, I sometimes shared the successes of this website with my students. Not to brag, but to show them that dedication to writing they love can sometimes pay off. When I found out I had been sent a free set of Le Creuset cookware from the company, I told my class about it. When this website won the Best Food Blog: Theme, I shared it with my delighted crew. And in early March, after spending six straight weeks of December and January writing every day after school  and all day long on the weekends  I found out that the agent with whom I most wanted to work approves of my book proposal. So, when I signed with my literary agent, my writing students were among the first to know my giddy news. I know. I know  I teach journalism. I buried that lead. Yes, its true. I have a literary agent now. All winter and spring I have been working on a book proposal for a narrative cookbook, a guide to living gluten-free, joyfully alive. There will be recipes and helpful hints for the kitchen. Photographs will fill its pages vividly. And of course, there will be stories. Writing the book proposal, and revising it, working with my agent, and starting to write the book  all in the midst of being a full-time teacher? It has consumed me, happily. And if I have sometimes been missing from this site, sporadically, you now know why. (Well, that and one other reason, yet to be revealed.) I have been writing all my life, longing for bound books with my name sitting on the shelf. Never could you have told me that the seemingly impossible dream of attaining a great agent would happen because I had to go gluten-free. Life constantly surprises me. The joy comes tumbling out of me. And there will be many more books besides this one yet to come. This was the ongoing story I shared with my students at the beginning of each class. It was important for me  I wanted them to know that all the writing I urged them to do every day (lets be honest: I also required them to write every day) can pay off in the end. I wanted them to hear that a working writer still struggles and wonders and has to push herself to throw sentences down on the page. And besides, I couldnt contain my joy with them. They were my community of writers this year, an extraordinary group of people who shared my sensibilities. For some ineffable reason, we all feel the need to watch ink spooling out from the end of our pens or listen to the clack of our fingers on the keyboard. They understood. I understood them. I am not a perfect teacher. That is not the point of this piece. But I do love my students. To me, they are human beings before they are students with academic records and holes in the grade book. And this group? I am sorely sad to see them go. And so, this weekend, we celebrated the only way I know how. With stories and food, in the sunlight, laughing. Somehow, the name frittata intimidated me for years. It just sounded complicated. As soon as I went gluten-free, however, I started experimenting with every recipe that sounded beyond my reach. If it didnt have gluten, I wanted to try it. Now, I make frittatas every week, at least. With fresh snow peas and goat cheese (as pictured above), they can be the quintessence of spring. Try chopped tomatoes, oregano, and fresh mozzarella for a pizza frittata. Or, you can make this one, which I threw together for our class picnic. There are endless variations on frittatas, the same way that any combination of eighteen students can add up to a different class. Preheat the oven to 350°. Place a ten-inch skillet (one that can go in the oven) on medium high heat until it is fully heated. Add the olive oil or butter, then the spring onions. Sauté the onions until they have softened, which will be about four or five minutes. Add the mushroom slices and herbs. While the mushrooms are softening and taking on all the heat of the onions, beat the eggs lightly, adding the salt and pepper. Pour the eggs over the sautéed vegetables. Stir the egg mixture lightly with wooden spoon until they start to set. Add in dollops of goat cheese and avocado at this time. When it looks as though the eggs have started to set, lift one edge, gently, up from its place, with a thin rubber spatula. Lift up the skillet to tilt it toward you and allow the uncooked egg to run underneath. Place the skillet on the level again and sweirl it gently to distribute the egg. Continue cooking the eggs for forty seconds or so, continuing to lift and or unitl the egg on top is no longer runny. 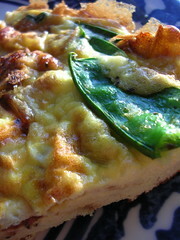 Place the skillet in the the oven and bake it until the frittata top is dry to the touch. This should take about five minutes. Watch it closely. Gently, guide the rubber spatula around the outside edges of the frittata to loosen it. Turn the skillet over, onto a waiting plate, and then flip it around for a lovely presentation. Serve this warm, at room temperature, or refrigerated. Awww, Shauna, what a sweet story about your students. I feel as if I know them, just a little now. Isn’t it wonderful when we can touch someone’s life and yet they can touch our life also? A true interchange of encouragement…. And what exciting news you have shared! Congratulations!!!! I am so happy for you and so thrilled with the update! I hope it all goes very well for you. I weep, and I applaud. Yippie!!! I am delighted at your wonderful news, my dear, and so very moved by the story of your students (she writes, as she wipes away tears). Both leave me inspired and encouraged and excited about what is to come. Congratulations on following you passions, and thank you for sharing them with us. I cannot wait to read your book! Hurrah, my dear Shauna! I have been waiting patiently for this post, so that I could whoop and holler about your book to the whole wide world. I am so excited for you, my friend, and for all that the past year has brought you. And just think of what is to come! I’m so glad that I get to hug and toast with you the whole way. This is great to read you and sense your passion about writing and the way you embrace* your job at school. And I am very happy for your book deal: congratulations! This is trully deserved and I am eager to see your book! there are two words which i will remember you using most frequently: deeply and ineffible. Well let me tell you, in all sincerity, that you have deeply impacted my life in an ineffible way. I hope you are aware at how much you have taught all of us. How much you have taught me. Without the constant pressure to write this year, I’m not sure how I would have made it out sane. I know we never sat down to talk about my pieces, but if you hadn’t pushed me to do my screenplay I never would have touched it. To me, that is one of the most important pieces i have ever written. It was urgent, and i now understand just how important that feeling can be. I have become comfortable with myself Shauna, and that has much to do with you. I now know that “I don’t know” isn’t always a bad thing. I now know that as long as i have a pen to write with I can move mountains. I have a restaurant to recommend. Shauna, I’ve been quietly reading your beautiful blog for a while now. Gluten-free Girl is one of the very first food blogs I came across and remains one of my favourites. The post about your students is glorious and many, many congratulations on the book deal – I can’t wait to see it published. I’m a naturopath in Sydney, Australia and regularly point clients towards your blog. Being gluten intolerant freaks many people out – “what is there left to eat?”. However your blog and your writing show that it doesn’t have to be a negative, something to be bitter and resentful about. Instead there are other foods, eating experiences, ingredients and food can still be one of the joyous things in your life. Yet again, congratulations, and thanks for your blog. What an amazing entry, and such amazing news in it. Your students are lucky to have you, and, as you’ve shown, you’ve been equally blessed with them. Congratulations! I hope you continue to find success and keep sharing your joy with the world. Shauna: You are a study in being alive.Such good news coming to such a good person. It makes you feel like, at just these times, all the stars are aligned. I have always admired you and your blog. Not just for the food, but for your incredible optimism and joy. Your last piece brought tears to my eyes. My son is entering 9th grade this fall in a school just north of yours. I hope that he finds his own Shauna there. OMG! Congratulations a million times over!!! That is wonderful news. What a great summer you will have.